We destroyed a heap of webbing and cord to find out which climbing knife will cut when you need it most. The results were clear: The Petzl Spatha outclassed the competition in almost every way. To be clear, this test essentially included two categories. Two of the knives (the Petzl Spatha and Edelrid Rope Tooth) are larger and more usable, with handles that function as sheaths. The other two (the CRKT NIAD and Trango Piranha) are small, ultralight emergency knives with metal handles and no sheath. Both styles have their place, but all climbing knives earn their salt in self-rescue scenarios. To make sure each could serve to clear away tat or cut loose an injured climber, we used all four to chop up a variety of connectors from webbing to dyneema to cord. The results were more disparate than we expected. Read on for details. The 4 climbing knives we tested. The Spatha impressed in every single one of our tests. Most remarkable was the sheer cutting power: the Spatha sliced through most varieties of webbing in just one or two strokes. In one test, the Spatha was twice as quick as any other knife — and over a minute and a half quicker than its direct competitor from Edelrid. A little industrial research reveals that the Spatha uses the highest-quality steel of the bunch. It’s sharp and versatile, but should hold up well to long-term use and resharpening. Other elements of the design are equally thoughtful. The clip-in point is nicely sized, the blade cutout makes opening the knife easy, and locking/unlocking the knife is equally intuitive. Surrounding the clip-in point is a textured plastic wheel that allows for easy manipulation with climbing gloves, removing the worry of slicing open a mitt. While it’s heavier than the CRKT NIAD by 26 grams (less than the weight of a typical wiregate carabiner), having a true handle means that the Spatha is much more usable for everyday and camp tasks. And although the Rope Tooth’s blade is a hair longer, the Spatha has a slightly longer handle, which helps it sit securely in larger hands. All in all, the Spatha wowed testers. It’s not the cheapest in the test, but at $29.95 retail as of this writing we still consider it a bargain. As the back of the NIAD’s blade proudly proclaims, the knife was designed by none other than legendary Yosemite speed demon Hans Florine. It’s a neat and effective design, and at 17 grams the NIAD is the lightest knife in this test. You hardly notice it in a pack or on a harness. The clip-in point doubles as a lock: the blade can’t open as long as a carabiner is clipped through the hole. There’s also a smaller hole for attaching a leash or lanyard, and the titanium handle is both light and corrosion-resistant. When unfolded, the NIAD was an excellent performer in the cutting tests, bested only by the Petzl. A small divot at the base of the blade provides a place for the index finger to nest, which allows a surprisingly secure grip for such a small blade. By nature of its size, the NIAD isn’t nearly as effective for all-around use, but it can manage in a pinch. The only real downside to the NIAD is the price. 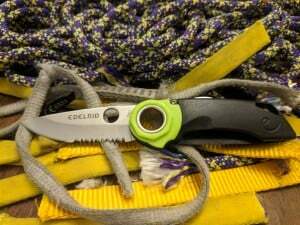 At nearly $50, it’s by far the most expensive climbing knife in our test. That may be worth it to some buyers — if you want the most effective and usable emergency knife, this is it. CRKT also backs the NIAD with a lifetime warranty, so it’s a purchase you’ll only have to make once. Note: If you want more ultralight knife recommendations, check out our guide to the best backpacking knives. The NIAD’s pinch grip and flat-top serrations make for pleasantly precise cutting. If you want an emergency knife but balk at the price of the NIAD, the Piranha is a worthy replacement. It didn’t perform quite as well in our testing, but it still got the job done on every type of fabric we could throw at it. The Piranha has the shortest blade of the four knives, which makes it a specialized tool. It feels closer to a compact X-Acto knife than a pocket knife. Like the NIAD, it has a small divot at the base of the blade to allow you to pinch the knife as you cut. The handle is even shorter than that of the NIAD, which means that for those of us with large hands, only the first two fingers can grip the handle. In general the Piranha is clunkier to use, but it’s acceptable once you’re used to it. For emergency use, the small blade was effective if not exceptional in all our tests. The stainless steel handle makes the Piranha a couple grams heavier than the NIAD, but it’s barely noticeable, and the Piranha is just as comfortable on a keychain. Plus, the Piranha has one feature that no other knife could match — a bottle opener for popping open a summit beer. The greatest asset of the Piranha is its price. At $19.95, it ties the Edelrid for the cheapest in the test and is less than half the price of the NIAD. For comparable emergency performance, that’s a good value. Trango also sells the Trango Shark, which combines a nut tool with the Piranha. We’ve tested the Shark as well; you can read our review of it in our guide to the best nut tools. While the other three knives all had reasonable arguments in their favor, the Edelrid was the opposite. I hate to say it, but I don’t recommend this knife to anyone. We can start with performance, where the Edelrid was a distant, distant last. The other three knives all cut through a standard 18mm sling in under ten seconds. The Rope Tooth took more than a minute and a half. The serrated blade seemed both dull and prone to snags, and it required far more energy to cut through even thin material. Although it has the longest blade of any knife in our test, the plastic handle is shorter than the Spatha’s and has no texture for grip. It’s still more versatile than the emergency knives, but it’s not reassuring during all-around use. Worst of all, however, is the Rope Tooth’s locking mechanism — which just didn’t work. With disturbingly little pressure, the knife would fold from its open and locked position. Both my fellow tester and I cut ourselves due to this flaw. The Rope Tooth is cheaper than the Spatha, but in this case the extra $10 is well worth spending. With such serious flaws, we think the Rope Tooth is poor value even at $20. Choosing a climbing knife comes down to a few basic considerations. The two main differences between the knives in this test are handle material and blade length. Full-length knives (Spatha and Rope Tooth) use plastic handles that also function as a sheath when the knife is closed. The handles are still compact, but they allow for an easier and more familiar grip. A longer blade also means more versatility — from cutting off tape gloves to slicing up vegetables, the larger knives are easier to handle. Compact knives like these won’t have you skinning bears or chopping wood, but they’re reasonable for general backpacking and camping use. Smaller blades (Piranha and NIAD) are less friendly for general use. While the full-length blades have both serrated and un-serrated sections, the shorter blades are almost entirely serrated. That’s great for cutting cord but less adaptable to other tasks. The smaller knives use metal handles with a simple frame lock. To avoid the need for a sheath, both are built so that the blade lies flat against the handle when folded. It makes the knives impressively compact, but also means that handle space is very limited. Both require pinching the handle right at the base of the blade, which, again, is effective for hacking webbing but less friendly for larger tasks. All four knives have clip-in points and/or lanyard attachment points. The Spatha and Rope Tooth can be opened while clipped to a carabiner, but the Piranha and NIAD cannot. The ultralight NIAD and Piranha exist for a reason: many climbers only need to carry a knife to trim old webbing or in case of self-rescue. Especially for alpinists, it’s prudent to have a simple knife that takes up as little space and weight as possible. If your needs are similar, look to the NIAD or the Piranha. If you don’t need to trim every gram, consider the Petzl Spatha. The penalties are slim, adding less than an ounce of weight and a couple inches of size. In exchange, you get the very best performance in a design that works just as well as a camp knife. The NIAD and Piranha are probably smaller than your car key. For full-length blades, our only recommended option is the Spatha. Luckily, it costs less than $30 as of this writing and comes with a three-year guarantee from Petzl. For emergency knives, the choice comes down to price. The NIAD is significantly more expensive, but offers slightly better performance in a more usable design. The Piranha isn’t quite as user-friendly, but it’s a decent performer at a wallet-friendly price. The Rope Tooth’s unpredictable ways made for a slightly dangerous test. To make sure that all these knives were portable, we took them up a few climbs in packs and on harnesses. Then we got down to the meat of testing: timed cuts on 18mm nylon slings, 12mm dyneema, 1-inch webbing, and 7mm nylon cord. Results were consistent across materials; strong performers were strong across the board. How well does the knife cut through various materials? How hard do I have to work to use the knife effectively? How well does the knife handle general tasks? Can the knife be used for more than just cutting rope and webbing? How much space does the knife take up in a pack? How much do I notice it on a harness?